Give your photos a 100% analogue finish with high-res film emulations! 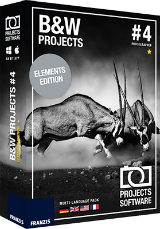 Black&White projects 4 elements was available as a giveaway on March 6, 2017! 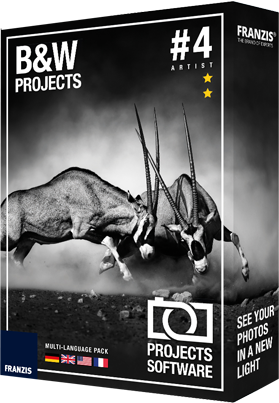 BLACK&WHITE projects 4 is the perfect tool to enable all photographers with a special affinity for black and white photos to make their creative mark. The new spectral sensitivity engine allows you to grasp the grey value for every converted colour and customise it to any tone value. 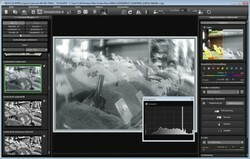 The 80 handcrafted presets offer you a plethora of options from your images’ hidden information. Give your picture a 100% analogue finish with high-res film emulations adapted from classics like Ilford, Kodak, Rollei and Fuji. Strong expressions, even with difficult lighting situations. How would you improve Black&White projects 4 elements? RAW mode and advanced RAW features and so on. 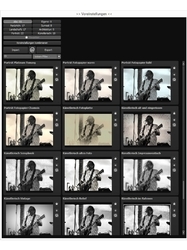 Special price for GOTD users: get BLACK & WHITE projects 4 for only $25.00 instead of $99.00! Thanks GOTD and Franzis, great product as usual with the two of you. No idea why there is so much fuss, and such a problem with some on getting the codes. This is the third product I have downloaded in the past few months and the process has always been seamless. As I am already set up (registered) with Franzis, I just log in with my e-mail and the original password (they sent me the first time to register their products), and always click on to receive their newsletter (even if I had done that with the first product I downloaded) as that is part of the deal to get their free products. Unzip, start setup, click on internet link (top of first box in setup), go to Franzis free GOTD code page, enter my information (oh darn, forgot the password, click on forgot password, enter my email, confirm), (receive password and go back to the registration page left open), enter my information, click receive news letter (do this every time), confirm. Wait, receive confirmation email and codes, enter in program, finish setup. The whole process took under 10 minutes, and it would of been faster had I not forgotten my password for Francis's site. So, the last minute in the setup was to save the password for future use so I don't have to click on forgot my password. Thanks again GOTD and Franzis, as I will look forward to using this product. All I get is this when trying to register..
2 code and the registration totally fails. Hardly convinces me to purchase full products from their site. All I get is this when trying to register.. Dear Mrs , Thanks for registering your product: Photo BuZZer Windows - giveawayoftheday 2 code and the registration totally fails. Hardly convinces me to purchase full products from their site. Downloaded fine, get to Set Up and clicked internet and then I get a pop up that says Access with App or Default Browser and then it freezes, stays on top of every screen, cannot get rid of it unless I restart. The OK button is greyed out, so I cannot click to go to the website. I could enter data into the User ID and Reg forms if I had the info, but I cannot get the registration without going to the page. How can I get to the page without the Internet button? What is the URL for the registration page? Downloaded fine, get to Set Up and clicked internet and then I get a pop up that says Access with App or Default Browser and then it freezes, stays on top of every screen, cannot get rid of it unless I restart. The OK button is greyed out, so I cannot click to go to the website. I could enter data into the User ID and Reg forms if I had the info, but I cannot get the registration without going to the page. How can I get to the page without the Internet button? What is the URL for the registration page? Thanks! Just a thank you. Downloaded and installed without issue. Played around with it a bit, seems pretty straightforward, also appreciate the inclusion of the user's manual. Still waiting for my e-mail. I already had an account, and logged in successfully. I've been waiting for several hours. Trevor, found mine in the Spam/Junk folder of my email account, but was easily able to retrieve it. Best of luck! One Hour Later.........Downloaded 3 times, tried to install, comes up with a Splash Screen wanting personal ID and Reg Code - FINE BUT when I do click the Internet button, it of course goes to the Page, try to sign in - 4 times, error again "Invalid", then the "forgot password" bit, same thing, no email, etc etc etc.......I do a lot of B&W ancient Negatives, STILL won't get past Splash Screen, and if ya click "later to continue, the install CLOSES..........several tries since.......NOTHING....just the same "STUFF"
iwontell, Mails from Franzis comes never quickly. Today I have waiting more than thirty minutes. You can also create a new account with an other email. This publisher always has an overly complicate registration process. Can someone explain to them that there is a readme file? All that is needed is for them to include any registration requirements into this readme file. That would reduce the frustrations for us users. iwontell, This publisher always has an overly complicate registration process. Can someone explain to them that there is a readme file? All that is needed is for them to include any registration requirements into this readme file. That would reduce the frustrations for us users. gpc111, I agree! The registration process felt very much like a late-night scavenger hunt! Guess it will be worth it if the software is useful. gpc111, I agree! The registration process felt very much like a late-night scavenger hunt! Guess it will be worth it if the software is useful. I have used several Franzis products for a few years, and have been very happy with them. I did have a problem with the registration email that I received, however. The Serial Number/Registration key had a "?" at the end of it, which had to be removed, before the program accepted the key. Also, the misspellings of Black as Balck doesn't look good. Doesn't seem to scale well on my screen (3200x1800) Win 10. Anyone have the same problem/ solution? Dig, is that a multi-monitor setup? Dig, I know the latest version (5) has been optimised for high-res screens (specifically 4k), so it's quite possible that is a limitation of the older versions as otherwise they probably wouldn't have said that. JohnL, ok thanks for that. It's a no-no for me then. M. H., no it's a laptop. I, too, have had the same issue with this and previous Franzis offers from GOTD. I have a 3840x2160 laptop panel, default scaled by 250% so that most other legacy software, text and icons display OK; however, their titles seem to always show up with incredibly tiny menus, text, etc. I have to use a magnifier (assistive software utility) to read them! Thanks for the software to try out! Dig, I, too, have had the same issue with this and previous Franzis offers from GOTD. I have a 3840x2160 laptop panel, default scaled by 250% so that most other legacy software, text and icons display OK; however, their titles seem to always show up with incredibly tiny menus, text, etc. I have to use a magnifier (assistive software utility) to read them! Thanks for the software to try out! "Right-click on the app and choose Properties. Click on the Compatibility tab and check the box for Override high DPI scaling behaviour and then choose System (Enhanced) from the pull-down menu." Dig, Sorry for the really late reply, but I thought you might be interested that the upcoming Creators Update for Windows 10 adds options to scale programs better for high-res displays, so the next similar thing that comes along might be worth getting for when that appears. Note the following will only work after the Update rolls out (in "Spring", presumably the Northern Hemisphere one): "Right-click on the app and choose Properties. Click on the Compatibility tab and check the box for Override high DPI scaling behaviour and then choose System (Enhanced) from the pull-down menu." I passed on the free version and went for the good deal on the full one. I've used there products for a while now and they work very well and $25 is an excellent deal. Thanks Franzis for a great deal! please read the readme doc to the end as it describes the whole registration procedure! I followed the registration procedure exactly, I have used and use Franzis software, and I had an account already set up. Nowhere in the readme doc does it state anything about this being a 30 day trial, or that a Serial Number is needed, so I am not sure why you suggested that I read it all assuming that I had not? Helen, I followed the registration procedure exactly, I have used and use Franzis software, and I had an account already set up. Nowhere in the readme doc does it state anything about this being a 30 day trial, or that a Serial Number is needed, so I am not sure why you suggested that I read it all assuming that I had not? You just don't seem to understand me, I did enter the User ID and Registration code I was sent on installing, however, each time I try to open the software it is still asking for a serial number? Where do I get this serial number from? Helen, You just don't seem to understand me, I did enter the User ID and Registration code I was sent on installing, however, each time I try to open the software it is still asking for a serial number? Where do I get this serial number from? CFT, You must read the Mail from Franzis, too! CFT, just use the exact same serial number. It worked for me -- no prob. What is the difference from “Dramatic Black and White”? I see that Dramatic Black and White is much smaller in size ~8Mb vs ~180Mb. it has less options and no batch. Dimma, good Q I see that Dramatic Black and White is much smaller in size ~8Mb vs ~180Mb. it has less options and no batch. I did something with normal pre-sets. I love the FX tattered edges (in the FX options), but can they be set? random? If they are fixed, the fun is gone. I love the FX tattered edges (in the FX options), but can they be set? random? If they are fixed, the fun is gone. adif, I was able to export the different silver tattered edges FX to BWP4 but it didn't keep it's silver look. it look the same as the BWP4 one. adif, I'm using a different version, but assuming you have an expert tab on the right go into that, look at the filters that are being used (the left panel items are just presets that drag in a bunch of filters and set their parameters). Select the filter that looks most likely and look at the bottom of the right tab to tweak it. adif, I'm using a different version, but assuming you have an expert tab on the right go into that, look at the filters that are being used (the left panel items are just presets that drag in a bunch of filters and set their parameters). Select the filter that looks most likely and look at the bottom of the right tab to tweak it. hope that made sense. I have Fransis SILVER projects professional (64-Bit) installed, is there any point upgrading with this GOTD? Hi anyone, I have Fransis SILVER projects professional (64-Bit) installed, is there any point upgrading with this GOTD? Note that in the so-called "elements" version does *not* include the Adobe Photoshop plug-in. Small (?) consolation, though, is that you may have both software installed. Or, so I believe. watson street, I can only tell you that Franzis "BLACK & WHITE projects" is the successor to their Silver series. Here's a comparison table between what you already own vs today's GOTD offer. Mind you, the web page is in German - use Google Translate to make it understandable in your preferred language: h**p://www.projects-software.de/hdr-vergleich/3/24,21/silver-projects-professional-vs-black--white-projects-4-elements Note that in the so-called "elements" version does *not* include the Adobe Photoshop plug-in. Small (?) consolation, though, is that you may have both software installed. Or, so I believe. "Small (?) consolation, though, is that you may have both software installed. Or, so I believe." Yes, Franzis has a number of products that they give away from time to time, sometimes based on the same app with a slightly different name & features. I regularly install one version next to another without problems. Ioannis, <i>"Small (?) consolation, though, is that you may have both software installed. Or, so I believe. "</i> Yes, Franzis has a number of products that they give away from time to time, sometimes based on the same app with a slightly different name & features. I regularly install one version next to another without problems. JohnL has outlined everything you all need to know but I'll just add that it's a solid bit of kit, great interface and easy to navigate with surprising results... pro pics with ease! Lovely Jubbly, thanks Franzis! JohnL has outlined everything you all need to know but I'll just add that it's a solid bit of kit, great interface and easy to navigate with surprising results... pro pics with ease! Thanks for that as I didn't have time to play around with them today. I will keep both. JohnL, Thanks for that as I didn't have time to play around with them today. I will keep both. Nigel, Version 5 has also been launced. JohnL, oops, sorry, used the path for HDR projects in teh Raw file update bit, apologies. JohnL, Happy birthday for today. Hope you get lots of pressies!!
" The main disadvantage is the lack of Undo operations. " “Create Restore Point” (undo point) saves an in-between point of the current settings. You can now always return to this stage of your editing. You can save as many editing restore points as you like. "Timeline" (list of undo points) displays the restore points and makes it possible to call up any phase with just a single click. This function is especially useful when, for example, you are satisfied with an image, yet want to continue trying out different settings and effects. Simply set a restore point and carry on editing your picture. If you want to go back, simply click on your restore point in the time-line. JohnL, " The main disadvantage is the lack of Undo operations. " From the User Manual: Work with a timeline and restore point -------------------------------------- This option can be found in the symbol bar at the top edge of the screen under the Information: “Create Restore Point” (undo point) saves an in-between point of the current settings. You can now always return to this stage of your editing. You can save as many editing restore points as you like. "Timeline" (list of undo points) displays the restore points and makes it possible to call up any phase with just a single click. This function is especially useful when, for example, you are satisfied with an image, yet want to continue trying out different settings and effects. Simply set a restore point and carry on editing your picture. If you want to go back, simply click on your restore point in the time-line. Thomas, This is true, but you have to explicitly create restore points, it doesn't help if you suddenly realise the last few changes have made it worse, but you're not sure what the exact settings were before you made those changes (I do it all the time with the filter and toning settings), which is what I'd usually want. Thanks for adding the clarification though and it is indeed a good point. Two years ago we tested SILVER projects BW , is this GOTD is new name? should we uninstall the silver first? Oh and you can have both installed. The main advantage of Silver Projects is you can mouse-hover over the film type and use a scroll wheel to change types, BWP3 is more advanced in every other way. adif, P.S. https://www.projects-software.com/compare/3/26,23/silver-projects-premium-vs-black--white-projects-3 Oh and you can have both installed. The main advantage of Silver Projects is you can mouse-hover over the film type and use a scroll wheel to change types, BWP3 is more advanced in every other way. "I was not aware there were so much different styles in B&W"
Strictly speaking, there aren't really. The reason for B&W photos is artistic -- looking at a B&W image you're forced to pay attention to some aspects of the picture because there isn't all that color to process & potentially confuse. There are also people who still do B&W film or prints, viewing the characteristics of the media they use [or emulate digitally] as part of the art itself. 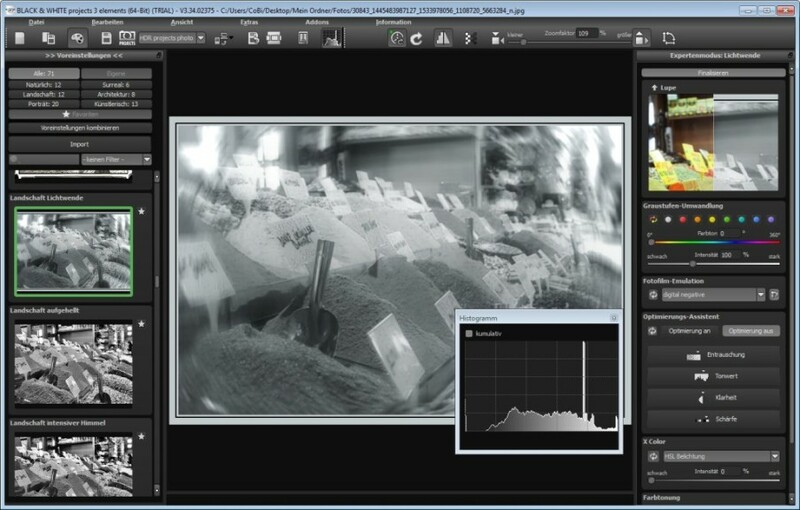 Shooting in color however gives you more data, and you can assign some of that extra data to enhance parts of the B&W image -- IOW you get a B&W image containing more data than you could hope to get just taking a B&W photo to begin with. Different styles or presets are more-or--less different ways of assigning that extra color data to the B&W version of the photo. 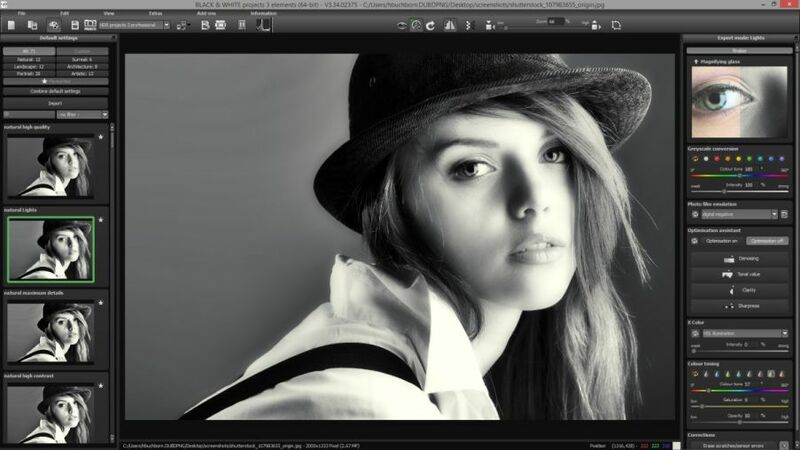 Some of the folks who specialize in these B&W image conversions save several different versions, each using different settings or software, then stack them as layers in an image editing app, applying masks, so that each layer is used for only part of the final image. Mavadelo, <i>"I was not aware there were so much different styles in B&W"</i> Strictly speaking, there aren't really. The reason for B&W photos is artistic -- looking at a B&W image you're forced to pay attention to some aspects of the picture because there isn't all that color to process & potentially confuse. There are also people who still do B&W film or prints, viewing the characteristics of the media they use [or emulate digitally] as part of the art itself. Shooting in color however gives you more data, and you can assign some of that extra data to enhance parts of the B&W image -- IOW you get a B&W image containing more data than you could hope to get just taking a B&W photo to begin with. Different styles or presets are more-or--less different ways of assigning that extra color data to the B&W version of the photo. 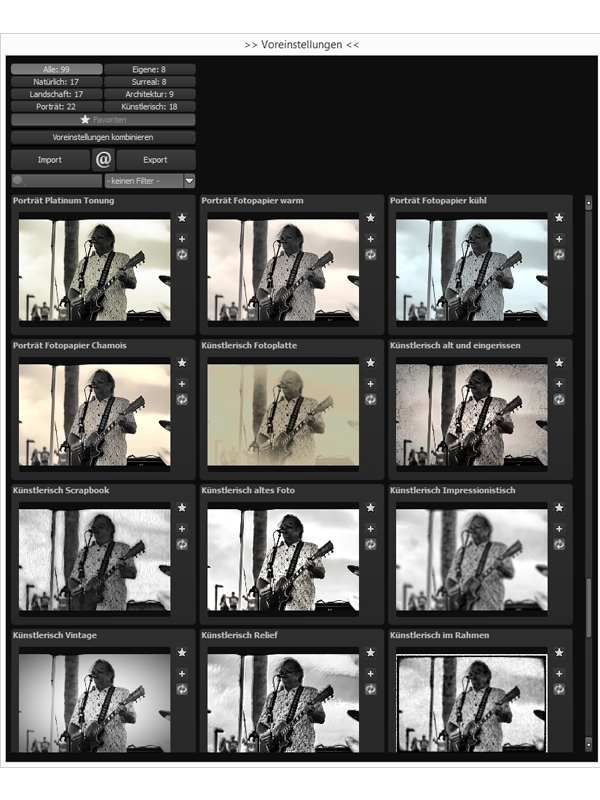 Some of the folks who specialize in these B&W image conversions save several different versions, each using different settings or software, then stack them as layers in an image editing app, applying masks, so that each layer is used for only part of the final image.